For the third straight year in a row, carbon dioxide emissions from industry, business activity, and fossil fuels were nearly flat. This was due to a decrease in global coal usage, coupled with an increase in the adoption of renewable energy technologies. In fact, a record 161 gigawatts (“GW”) of renewable power came online in 2017, bringing global total capacity to approximately 2,017 GW, far outpacing the 70 GW in new fossil fuel capacity generated in 2017. With this increase in renewable energy capacity, the world saw approximately 1.8 gigatons of carbon dioxide emissions avoided, as biomass, geothermal, ocean, small-hydro, solar, and waste-to-energy, as a proportion of world electricity generation, rose from 11 percent in 2016 to 12.1 percent in 2017. Renewable energy investment continues to grow among a growing number of Developed and Emerging Markets, with global investment rising two percent year-over-year in 2017, totaling over US$2.2 trillion. In fact, it is investment from Emerging Markets that is leading the way. Emerging Markets invested over US$177 billion in renewables in 2017, versus US$103 billion invested by Developed Markets during the same time. More specifically, China continues to be the world’s largest developer of renewable heat and power. In fact, in 2017, China invested over US$127 billion, accounting for almost 50 percent of total global expenditure. What has been driving the increase in investment and expenditure, has been the steep decline in electricity generation and capital investment costs. Specifically, falling costs for wind and solar in recent years, has made it more attractive to purchase megawatts of renewable energy equipment over more conventional energy supplies. Global government policy continues to remain accommodative for all types of renewable energy technologies, as a number of global governments implement their own renewable energy targets. Furthermore, many global cities have also given aid to the trend, as many cities establish commitments to be powered 100 percent by renewable energy in coming decades. Global power markets saw over 25 GW of new hydropower come online in 2017, increasing global capacity to approximately 1,181 GW. This increase in capacity led to a 3 percent increase in power generation from hydropower, relative to 2015, to over 4,000 terawatts, or approximately 17 percent of the world’s electricity. The top countries increasing installation capacity include China, Brazil, US, Canada, Russia, India, and Norway, all of which account for approximately 62 percent of installed capacity by early 2017. China continues to be the global leader in hydropower, with over 8.9 GW added in 2016, for a cumulative total of 305 GW. However, despite China’s dominance, Emerging Market countries such as Brazil, Ecuador, Ethiopia, Vietnam, and India are all closing the gap by installing their own capacity as well. Facility upgrades and modernization continues to be the main driver for industry operations and investment. The implementation of cutting-edge technologies and data analytical programs are increasingly becoming popular, in order to help utilities and governments improve power generation. 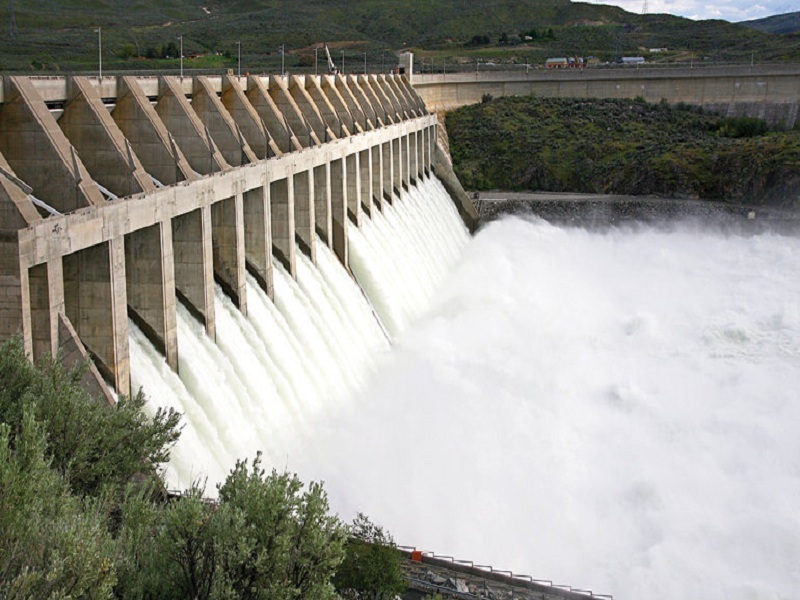 Despite, the optimism surrounding the hydropower industry, challenges do remain. Financing for projects and ongoing operations is a concern, as many projects rely on public financing for support. This is due to the fact that private investors shy away from such projects due to their low returns and high risks. Further, risks stemming from the impact(s) of climate change are a major concern for operators, as hazardous weather patterns could do lasting damage to operations. Nevertheless, despite these challenges, it is projected that the global cumulative capacity for hydropower will increase by 119 GW to over 1,300 GW by 2022. Over 55 GW of global wind power capacity was added in 2016, bringing total global capacity to 466 GW (451 GW onshore and 15 GW offshore). 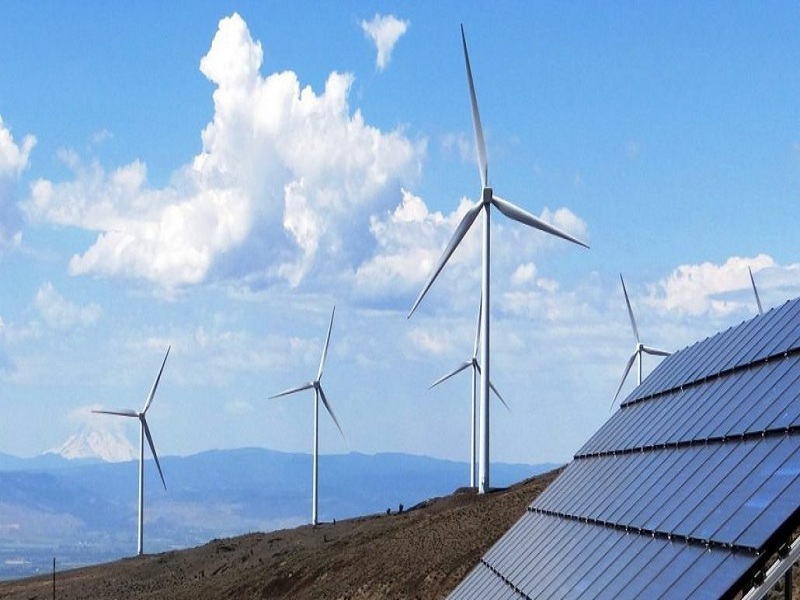 Onshore wind power continues to be the most predominate source of wind power, as it is much more cost-effective to install and operate, than offshore wind power, in many markets. Asia represented approximately 50 percent of total added capacity in 2016, with China being the primary leader in country-specific installations. China added 23 GW of new capacity in 2016, to bring their total capacity to 169 GW, accounting for over one-third of total global capacity. North America and Europe made up the bulk of the remainder, as the cost-efficiencies of wind power continues to make it an attractive energy solution for utilities in these regions. Moreover, new countries are slowly beginning to come online, as they connect their own wind power to their electricity grids. In fact, by the beginning of 2017, over 24 countries met 5 percent or more of their annual electricity demand through wind power. This trend continues to grow, as globally, wind power helps to meet approximately 4 percent of the world’s total electricity consumption. Onshore power continues to be the predominant form of wind power for many countries, as it is much more cost-effective to install and operate. However, offshore wind power is beginning see an increase in interest from both the public and private sectors, as the economics of offshore wind power has greatly improved in recent years. The combination of increasing economies of scale through larger projects and initiatives, technical improvements in wind turbines, and improved maintenance & optimization techniques, have all helped to reduce the perception of risk and financing costs for offshore projects. In spite of the increasing tailwinds powering the industry, there are some headwinds that the industry does face. Optimal locations for wind sites are often located in remote areas, far from cities where electricity is needed. Thus the need to build stable and secure transmission lines do pose great cost issues for operators. Nonetheless, wind turbine energy continues to progress, on the back of increased global competition and research and development. The underlying factors behind this drive in technological improvements, include the need to optimize power generation at lower wind speeds, as well as the need to reduce the cost and ease of turbine manufacturing and transportation. 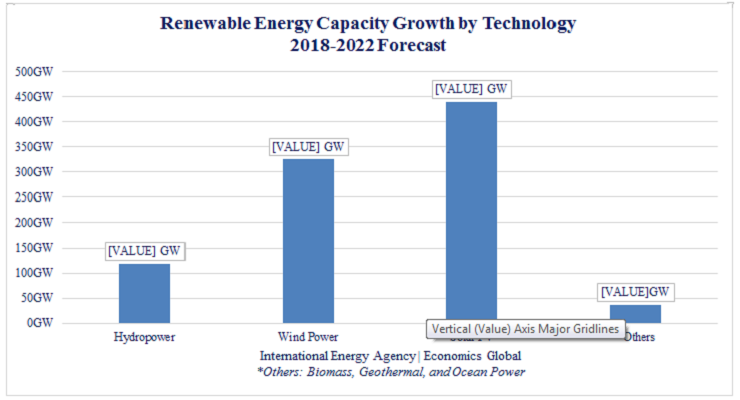 Going forward as these trends move forward, it is estimated that onshore wind capacity will grow by 299 GW to reach 750 GW by 2022, while global offshore wind capacity is expected grow by 26 GW to reach 41 GW by 2022. Solar photovoltaic (“PV”) power continues to be the world’s leading source of renewable energy. The global market for solar PV power rose 50 percent in 2016 by 75 GWdc, bringing to the global total capacity to 303 GWdc. Moreover, the number of large-scale plants around the world, continues to grow, with over 164 solar PV plants in operation generating 50 MW+ of power as of 2016. The top five countries, China, US, Japan, India and the UK, account for 85 percent of global capacity. China, the world’s leader in solar PV installations, added 34.5 GW of solar PV capacity in 2016, far more than any other country, to bring their total solar PV capacity to 77.4 GW. Despite the dominance of the world’s top five countries, other regions are catching up, contributing significantly to the global adoption of solar power. In Asia, South Korea, the Philippines, Thailand, and Vietnam have all increased their solar PV installations, as many nations have several plants under development or projects in the pipeline. 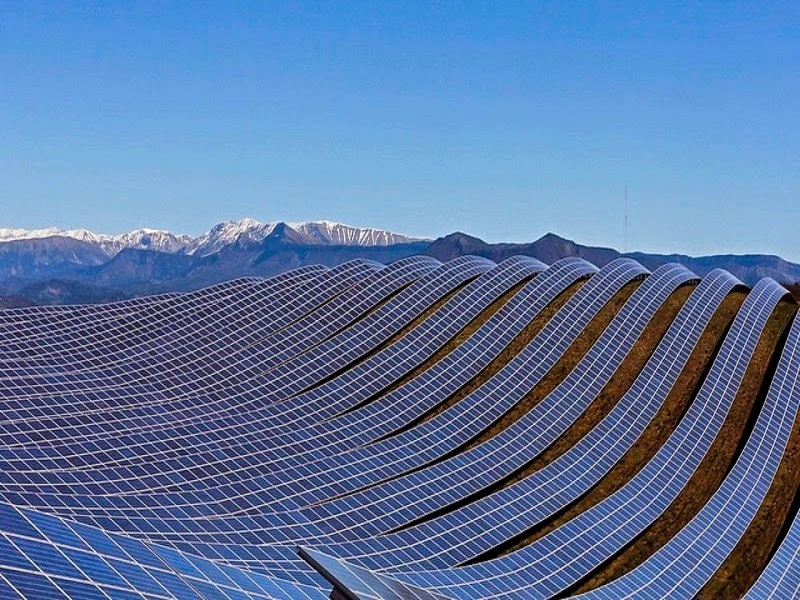 Moreover, Latin America is also seeing solar PV playing an important role in the region’s electricity generation, as countries such as Chile, implement large-scale PV projects to aid other sectors, such as mining and infrastructure development. One driver of growth within the industry, has been the rise of grid-connected systems. Centralized large-scale projects have grown the most to possess the largest market share of installations, as the availability of low-cost financing, the usage of tender offers in the electricity bidding process, and increasing economies of scale, have all allowed large-scale project installations to surpass decentralized (rooftop systems) in recent years, without any signs of slowing down. Despite the spectacular growth of the solar industry, there are some clouds on the horizon. Due to greater increases in production capacity, as well as lower market expectations in larger markets, the industry continues to see falling prices for inverters, cells, and modules. This is causing problems for solar PV manufacturers, whose production costs are not falling, but are seeing their profit margins quickly eroding. This is putting great financial pressures on many manufacturers, leading to consolidation, and even bankruptcy, among key market participants. Overall, solar PV continues to become increasingly cost-competitive with traditional sources of power, with some projects even being more cost-effective than traditional fossil fuels. However, challenges do remain, as the industry is still vulnerable to unfavorable policy changes that may favor other renewable or traditional sources of energy over solar, as well as falling equipment prices. It is projected that global solar PV capacity will grow by an additional 440 GW to reach approximately 743 GW by 2022. The forecast for renewable energy continues to look quite bright, as growth is expected to continue through 2022. 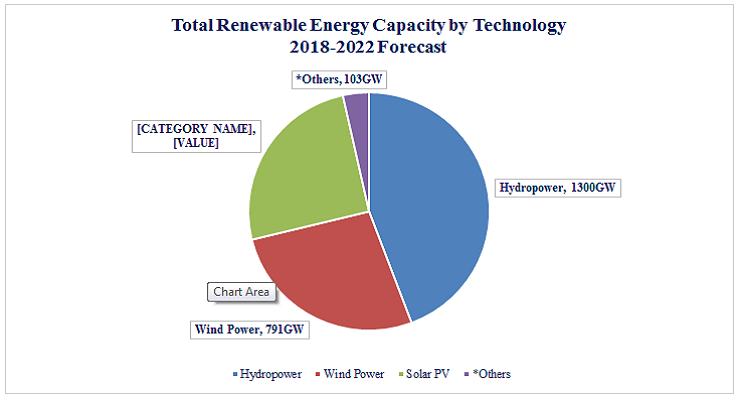 Global electrical capacity for renewable energy is projected to grow by approximately 920 GW, bringing total global capacity to approximately 2,937 by 2022, as China and India are expected to lead the way. China will continue to drive demand for renewable energy technologies, as the country’s concerns over its air pollution continues to be an important economic and health issue. With China’s 13th five-year plan to 2020, China’s renewable energy policies are being modified to tackle these problems. With China’s ambitions to modify their electricity grid, by bringing in new transmission and power lines, implementing power market reforms, and expanding renewable energy sources inland, these policies are expected to increase global demand and investment in wind and solar energy sources. India is also quickly emerging to become the world’s next global renewable energy powerhouse. As the country continues to undergo sweeping industrialization and urbanization, the country is moving quickly to address the failings in its utilities and power markets, as well as poor grid-connectivity across the country. This is being done, as an increase in infrastructure investment, and the removal of dark clouds surrounding government policy is underway. In fact, by 2022, India is expected to more than double its current renewable energy capacity, from 35 GW to over 107 GW, with wind and solar power expected to be the main power sources. In contrast however, Europe’s outlook does not look as sunny, as the region is expected to face headwinds over next few years. Issues such as overcapacity, weak electricity demand, and policy uncertainty are expected to hinder renewable energy growth within the region past 2020. 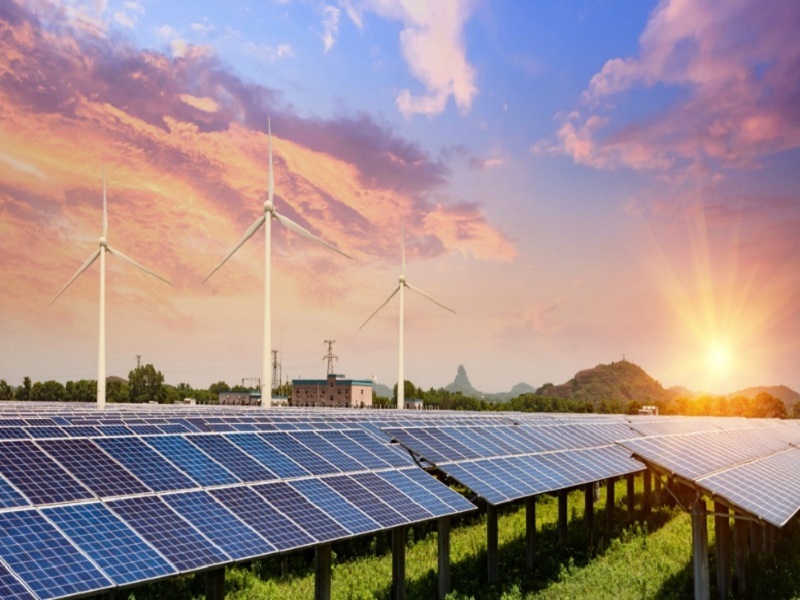 Investors looking to invest in the broad clean energy space can look to the iShares S&P Global Clean Energy Index Fund (“ICLN ETF”). This ETF allocates its holdings to a variety of renewable energy sources. The ICLN ETF provides investors with exposure to companies that provide the technology for the clean energy sector. More specifically, the ETF focuses on companies operating in the solar, wind, ethanol, biomass, and geothermal energy sources. This ETF can be useful to investors who a have a long-term bullish outlook on renewable energy. 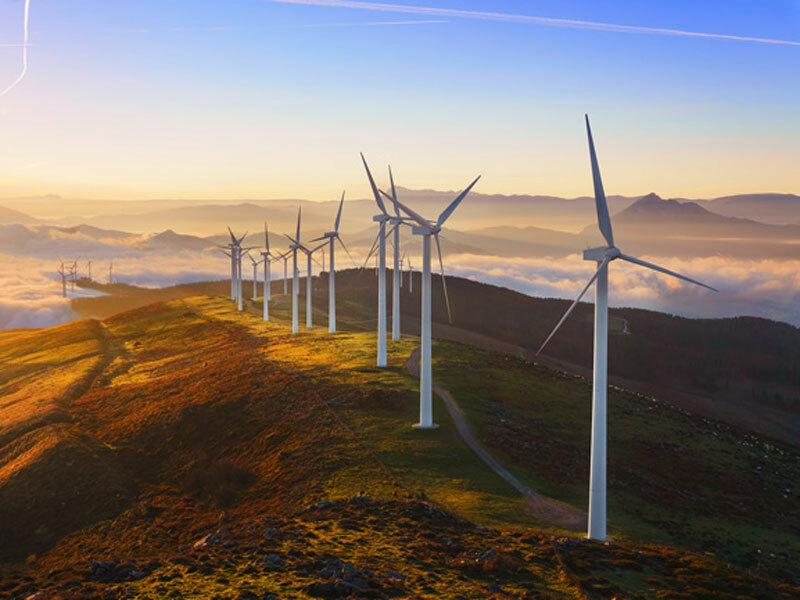 Investors who are looking to invest specifically in the wind sector, can look to the First Trust ISE Global Wind Energy Index Fund (“FAN ETF”). This ETF provides exposure to the global wind power industry. The FAN ETF provides investors with exposure to companies that provide the technology for the wind energy sector. This ETF can be useful to investors who have a long-term bullish outlook on wind power. As the global economy aims to reduce its global carbon footprint, renewable energy remains a fast growing industry. It is estimated by the World Bank, that the global economy needs over US$80 billion in investment in order to stabilize greenhouse gas emissions by 2025. Given this need, there is still plenty of room to run for this emerging industry. This report has been prepared by Economics Global as a resource for investors, traders and market participants. The estimates, projections, analysis and opinions contained within are our own, and can be subject to change and modification without notice. Economics Global and its employees are not liable or responsible whatsoever for any losses (both direct or indirect) or consequences arising from the use of this report. Use at your own discretion. This report is intended for information purposes only. It is not to be sold or distributed for profit by any third or non-affiliated parties. This report does not constitute an offer to buy or sell securities of any type, nor should it be used in place of a licensed financial advisor. The report, and all opinions, information and conclusions expressed within the report, are protected by copyright. This information may not be reproduced without prior consent from Economics Global. The information, statistics, data and analysis have all been prepared by Economics Global, and are all based on information and sources that are considered to be reliable.